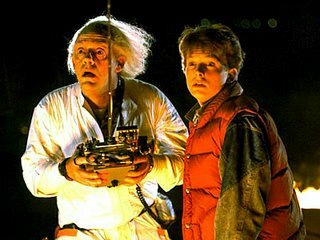 >Great Scott, Marty! It’s The ANBAD Time Machine! >Living the life of Riley/a wandering star/the tented semi-homeless somewhere in Europe has given me plenty of time for reflection. One of the nice, yet nasty, facets of A New Band A Day is, well, just that – every day brings a new, mewling and puking bunch of songs from another ace new band. This, of course, is the point, but it does also mean that some great bands are hidden away in the past, buried too far beneath all the other hundred of bands that have flirted with you each day to be dug out and appreciated. Thus: Here’s the ANBAD Time Machine, accelerating up to 88MPH and taking you back in tiiiiiime – just like a dreadful DJ at a village hall disco. Except with great bands you may have missed, plucked from the ANBAD archives. Today, we’re going ALL THE WAY BACK – to April 2008 when ANBAD was a clumsy, wobbling newborn; a time when pictures in posts were scarce, and there was a crappily drawn picture of a robot at the top of the page for some reason, instead of things to do with music. Still, there were some really ace bands that month, including the brilliant LA Preist, PixelH8 and the first appearance of our old ANBAD pals The Alibies. So go on, get retro and indulge in nostalgic discovery here! Posted on June 22, 2009 by Joe Sparrow. This entry was posted in Today's New Band and tagged ANBAD Time Machine. Bookmark the permalink.